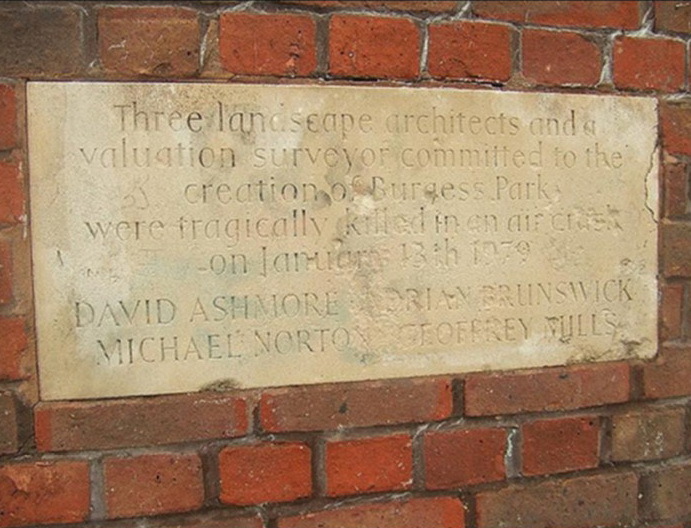 Three landscape architects and a valuation surveyor committed to the creation of Burgess Park were tragically killed in an air crash on January 13th 1979: David Ashmore; Adrian Brunswick; Michael Norton; Geoffrey Mills. Geoffrey Mills was the pilot - see his page for more details. Our information comes from the British Newspaper Archive: the Birmingham Daily Post - Monday 15 January 1979; and the Landscape Institute. 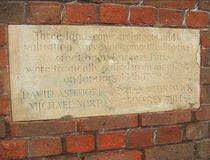 The plaque was brought to our attention by Londonist but when we went to take our own photos the plaque seems to have gone. Matt Brown has kindly allowed us to use the photo published in the Londonist piece. He took it in December 2008 and is certain that it was in this section of the park, north of the lake. The only red-brick that we could find there was this section of low retaining wall. The earliest Google Street View, July 2009, shows this wall in its current configuration, so it seems Matt was just in time to capture the plaque for posterity. Our photo of the wall without the plaque comes from Google Street View Sept 2017.